The Chew handicap fleet attracts a wide range of dinghies ranging from International 14s and RS800s all the way to Mirrors. We have recently divided the fleet into Fast Assymetric and Conventional divisions allowing them to race over different courses, so the Fast Assymetrices will sail on their preferred Windward/Leeward courses where practicable, whilst the rest of the fleet can enjoy a more varied course with a mix of beats runs and broad and tight reaches. The split is at PY 952, though we will allow the RS400s to chose which fleet they sail in and RS600s may opt for the conventional courses if they prefer. 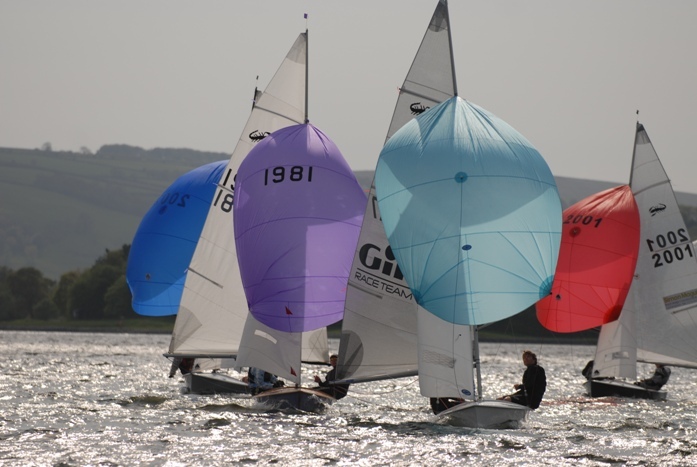 The club boasts a number of sailors who are well placed in their respective open and national competitions including classes such as the RS800, RS700, RS600, Musto Skiff, Cherub, Fireball, Contender, Blaze, Scorpion and Finn. We are keen to encourage newcomers and there are a number of less complex and possibly more stable classes active at the club including the Buzz, Phantom, Kestrel, RS200, Laser 3000, Laser 2000, National 12, Wayfarer, Laser Vago, Europe, Miracle, Mirror and others. On Wednesday evenings in the summer, the fleet split is altered and all classes faster than 1090 sail together as the A handicap, joined by the Flying Fifteens, whilst boats slower than 1090 mix it with the Solos and Toppers. The Lasers have a separate start. The Wednesday series is a great way to unwind from the pressure of work, mid week, and is the best attended and most competitive series in the club with over 75 boats taking part in the A fleet series last year. Even if they cannot make the 1900 start line the keen ones will come down to watch, have a meal and enjoy the atmosphere in the bar after racing. Many of the boats racing in the handicap fleets at double handers and there is a constant demand for crews. This is a good way to get started in the sport, pick up racing tips from more experienced helms and / or or to sail regularly without the expense of owning your own boat. If you are interested the website now has a crew-finder / helm-finder notice board or you could come along on a Sunday and ask around the fleet.